Telesat has announced the successful launch of the company's first LEO satellite, an important milestone in the company’s plans to deploy a global LEO constellation that will revolutionize broadband communications services around the world. 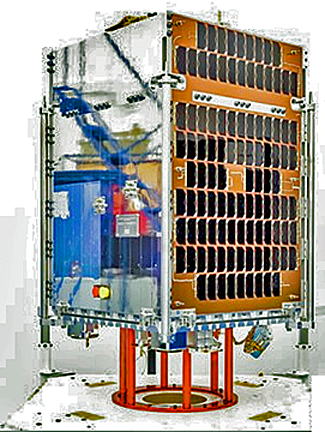 Telesat's Phase-1 satellite. Photo is courtesy of SSTs Kathryn Graham. Telesat’s Phase 1 LEO satellite was launched aboard a Polar Satellite Launch Vehicle (PSLV) operated by the Indian Space Research Organization (ISRO). The spacecraft was built by Surrey Satellite Technology Ltd. (SSTL) based in the U.K., part of the Airbus Defence and Space group. Telesat’s LEO constellation will deliver high-performing, cost-effective, fiber-like broadband anywhere in the world for business, government and individual users. The initial constellation will consist of approximately 120 satellites by 2021 and Telesat is evaluating options to expand its system beyond this initial configuration. The company’s Phase 1 testing will demonstrate key features of Telesat’s LEO system design, in particular the capability of the satellite and customer terminals to deliver a low-latency broadband experience that MEO and GEO satellites cannot provide. Telesat has installed ground infrastructure at its teleport in Allan Park in Canada to support testing and has customers in growing enterprise segments who will be participating in trials during 2018. Dan Goldberg, Telesat’s President and CEO, noted that Telesat has a long record of industry firsts that have brought major satellite innovations to market and the company's LEO constellation will be another breakthrough that transforms global communications. The launch of the Phase 1 satellite is the starting point in making Telesat's next-generation LEO system a reality and the company thank sSSTL and ISRO for the success of the mission to date.